This is the Player versus Player mode. It consists of two arenas, where players battle each other to win. 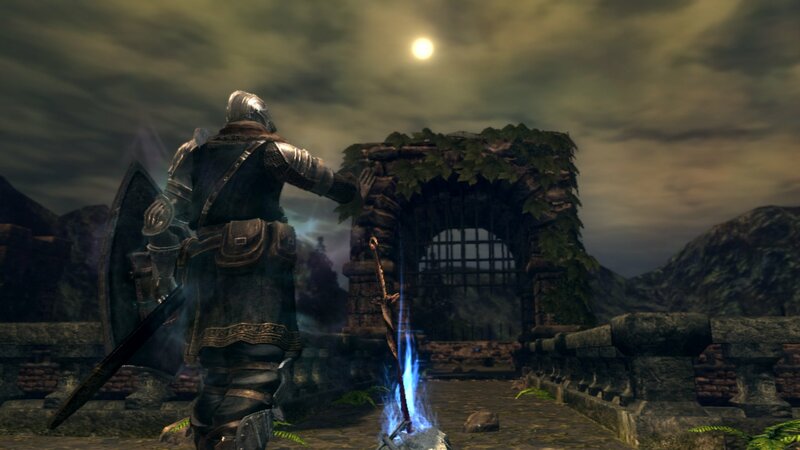 To join, the player must first beat the boss Artorias the Abysswalker; then heading to the exit, instead of going straight to the Oolacile Township, go to the right, and enter a long hallway with blue bonfires. You must have purchased the DLC to access the area. This is the arena selection lobby, from here you can choose arena and match type, and also view the leaderboard. For each arena there are 3 different modes: 1 vs 1 (duel), 2 vs 2 (team), and 4 players free for all (deathmatch). You have to touch one of the six blue bonfires along either wall, which will teleport you to the chosen arena. There are also several messages on the ground explaining how to join the different arenas. Once inside the arena, there are some messages explaining how Battle of Stoicism work. You will have to step onto one of the platforms to initiate a fight. Automatically, a search for players to battle with will begin. Depending on which platform you stand on, you will be hosting or summoned. You MUST stay inside the platform or the search for other players will be canceled. A simple square arena. Nowhere to run, nowhere to hide. A three tiered arena with a small staircase leading up to the floor above, and a narrow ditch below. In this arena you can also use the environment to your advantage, which can be useful for team- and deathmatches. When you go to your first ever arena you will receive the Purple Coward's Crystal, which is used to exit the arena during a match. If you stand on a platform that glows blue, you will be summoned into the host's world. If you stand on a platform that glows yellow, you will be hosting the fight. Original Dark Souls: Fights are organized in brackets of these level ranges: 1-50, 51-100, 101-200, 201+. Can't use ANY healing items, but heal miracles can be utilized. The player who lands most kills within the time limit wins. Draws are possible, and they will not end your kill-streak. The time limit in duels is 3 minutes. A Silver Crown indicates that the match is at a draw, while a Gold Crown marks the current leader. Immediate respawn after death. You are placed back in the cage with HP and spells replenished, before you are dropped down to the arena again. There's a short period of invincibility after dropping down, to prevent spawn-point camping. You can see red rings (much like white resonance rings but red), on top of platforms where players are standing. It is recommended that you stand on the platform with the less rings, so you can find a game faster. In Team/Deathmatch, each individual player must stand on separate platforms in order for the fight to begin. It is generally best if you keep an eye on each platform and go onto the platform with the least rings if you want to join a game quicker, as most people seem to just stand on one platform with the most rings. In duels neither you nor your enemies appear as phantoms; everyone looks like hosts (no glowing auras). In 2 v 2 team matches you are only able to target opposing players. The name and health bar of your team-mate will also always show above its head, which is especially useful if an opponent wears similar equipment and clothes. When the match goes into the One- minute left phase, all crowns go away, and there is no indication of who is in the lead anymore. This can lead to interesting battle techniques, because now hiding is possible. However, it is not recommended because your opponent could have the chance to leave, and deny you your win.